Banking on the skills of our qualified team of professionals, we are instrumental in offering supreme quality range of Areca Cup. We are a prominent supplier, importer and exporter of areca leaf cups , which can be used for packing the food and liquid food items. Also the areca leaf cups are available in different sizes and designs. Enriched by our vast industrial experience in this business, we are involved in offering an enormous quality range of Areca Leaf Cup. We are a reliable and recognized provider of Areca Leaf Cup. We have come up with unique range of these leaf cups. Contrary to what many people think, these leaf cups have excellent strength and are free from the effects of the moisture. Furthermore, one could avail these areca leaf cups in various shapes and sizes. We are the leading exporter of large quantity of Areca Cups to foreign markets. As per the client requirements. We will deliver on time basis and based on the requirements. 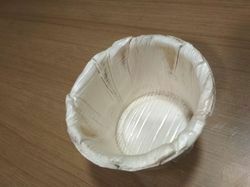 Being a well-distinguished company in the market, we are into offering Areca Leaf Cup. We offer alternates for plastics/ thermocol based products. These are made of natural fibres without the use of chemicals. Does not affect the ecology. These are heat resistant and microwaveable. The Oval cafe designs are designed for perfect evening parties to serve side dishes. There are 4 types of sizes in the same design to choose from. Arecanut Plate and cups are made of Arecanut Palm Leaf which is fallen naturally from Arecanut (Betel) tree. These plates are "Natures Gift" and better replacement of Anti-Environment plastics or polymers. These plates are purely natural and having no other artificial additives or chemical ingredients so that it rocks with new trends in catering sector. 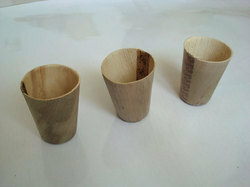 Our customer can avail from us superior quality Areca Cups that are in compliance with International Standards. Made of grade Areca Bark, our range is featured with Eco-friendly, Disposable & 100% Natural.